One thing that make Chesdin Landing special is its history with high-quality builders; the best home builders in the area have built custom homes in Chesdin Landing. This means that, unlike other planned communities, no two homes look alike. Every house is unique, which provides visual variety and individuality to our community that we are proud of. We have relationships with some of the most reputable custom home builders in the Richmond area as well, including Falcone Custom Homes. Falcone Custom Homes has a reputation as one of the most trustworthy and reliable home builders in the area. They will help to bring your wants, needs, and dreams to life in the design and construction of your new custom home. Falcone Custom Homes was established by Sergio Falcone. Falcone’s situation is unique amongst home builders in that he has a lifetime of experience with home design and construction. In fact, he was born into a family of builders. His father was a skilled artisan who worked in the Italian and French home building industries, which allowed him to learn the trade growing up. Not only was Falcone lucky enough to learn the home building trade from his father at a young age, he was provided with a wealth of experience as a result. Additionally, his exposure to home building methods, techniques, and styles in both France and Italy has allowed him to form a unique design style that’s all his own. His style mixes both European and Mediterranean influences. Their home building styles have translated to his creative expression and attention to detail, something that Falcone Custom Homes has become known for. In addition to skill and experience, Sergio Falcone also brings his commitment to customer satisfaction to the company. He understands that in order to build a successful custom home, it must meet all of the unique wants and needs of the client at their specific budget. It’s why the Falcone Custom Home building process is designed around the client. As such, it’s all about the client from the first moment on. Falcone Custom Homes will work closely with you to determine exactly what you are looking for and what you want out of your dream home. First of all, they have many different custom home plans that you can choose from. These existing home plans can be customized further to better meet your needs, but offer a great starting point – especially if you’re not 100% sure on what you want. Of course, if you are sure, then Falcone Custom Homes is all ears. You can bring your own plans to them and they will help you to realize them. They will also work within your budget and help to determine what the costs of your project will be. Falcone Custom Homes will be able to help find ways to save money on construction by tweaking certain design elements without affecting what it is you want. For example, they can switch out one material for another, more affordable material, without making huge sacrifices in quality. In fact, Falcone Custom Homes knows that a high-quality house requires high-quality materials. While they can find ways to save money in order to stay within budget, they won’t cut corners that could compromise the quality of your home in order to save money. Once the custom home plan is completely laid out, they will oversee the construction process from beginning to end. You won’t be left out of the process either. They will make sure to keep you informed about all milestone dates and any issues that might come up, thereby ensuring you peace of mind. Additionally, they will make sure that someone is available to address all questions and concerns that you might have throughout the home building process. 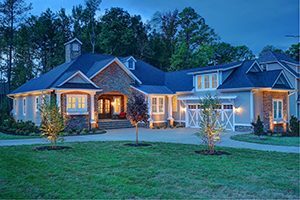 Falcone Custom Homes has earned a stellar reputation throughout the area as a highly-skilled and experienced custom home builder that emphasizes customer service. If you’re looking to build your house in Chesdin Landing, then you can’t go wrong with Falcone Custom Homes to bring your dream home to life. For more information about our community or the exceptional custom home builders that we work with, be sure to contact us at Chesdin Landing today.